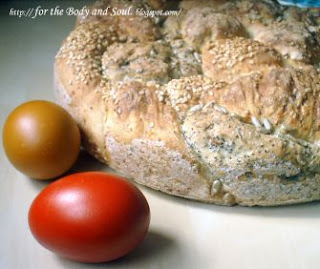 This bread is something my family is always looking forward most on our Easter table. I made it first a few years ago using a recipe from a magazine – I can’t remember now what exactly was the magazine. The bread is truly wonderful, tender and fluffy; filled with a whole range of grains it’s just a wonderful combination of textures and flavors. 1. Crumble the yeast in a large bowl. Add 100 g of flour, 1 teaspoon of sugar and all the water. Stir to combine. Cover with a dishtowel or plastic wrap and set aside for 30 min. 2. In a big bowl combine the remaining flour, sugar and 1 teaspoon of salt. Fold in the yeast mixture; knead to form dense, smooth dough. Cover the bowl with a dishtowel or plastic wrap and set aside in a warm place for another 30 min. 3. When the dough’s doubled in size, knead for 1-2 minutes, then divide into three equal parts. 4. Preheat the oven to 200 C (390 F). 5. Combine the grated carrots, pistachios, lemon juice, and ginger together. Add to one part of the dough, knead until the carrots are incorporated. Add more flour if sticky. 6. 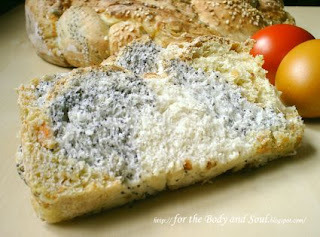 Knead the second part of the dough with poppy seeds and sunflower seeds and the third part with ground almonds and sesame seeds. 7. Roll each piece into a long strand. Lay the strands side by side and gently braid them. 8. Place the woven dough in a wreath shape on a greased cookie sheet, tucking the ends under. Cover and set aside for 30 minutes. 9. Brush with water. Bake for about 30 minutes.